Until actually confronted with having to make a life and death decision, who can know, with absolute certainty, how they will react? 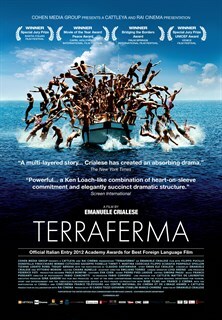 Set on and around a summer tourist island off the coast of Sicily, Terraferma tells the story of two struggling, yet disparate families, whose members become fatefully intertwined. A well intentioned, but illegal rescue of immigrant ‘boat people,’ forces the individuals of the indigenous family to choose between their economic survival and doing the morally correct thing with respect to the family they’ve saved at sea. In the process, both families are slowly torn apart as they come to grips with the harsh reality and consequences of their actions.